ZIM ZAM ZOUM gives the children enthusiasm for the language, helps them to feel they are achieving and leaves them singing the songs for days! Zim Zam Zoum is brilliant! It makes people enjoy learning French. The singing is the best bit. ZZZ is a fun and easy way to learn French at home and school. I love it ! the success of Zim Zam Zoum ! non-specialists to use, yet contains more than enough depth and range for specialist teachers as well. The children learn new words and structures quickly and effortlessly, thanks to the high quality animations, engaging lyrics and catchy tunes. Through the feelgood factor of the songs, the whole TBS approach motivates learners by making sure they enjoy learning French, creating a playful yet challenging learning environment and building confidence in pupils and teachers. There is a wealth of original and stimulating supporting activities in the interactive whiteboard version, skilfully linked to the KS2 Framework, which teachers and pupils can easily navigate. We are so confident that this key resource will support pupils to progress quickly that we have purchased site licences for all our schools in North Yorkshire and have built ZZZ into our scheme of work and training courses. Even some of our secondary colleagues are using it in Year 7 to ease transition and build on the TBS methodology in KS3. Our teachers look forward to teaching French and one of their favourite tools is ZZZ. The stunning Taught By Song team's animations are some of the best multimedia productions ever... The content, pace and animations come together brilliantly to promote enjoyment and learning, with subtle touches and a driving theme song that has everyone dancing and smiling. The children and teachers love it and it has instantly become a key part of my toolkit. I'm buying site licences for every Hackney primary school that does French, and would recommend other local authorities do the same. TBS was developed in an Oxford prep school, and goes down better than anything I've ever seen with Hackney children. This technology, and above all the flexibility it gives us in matching work to children's needs, puts us in a position to make "languages for all" a reality. Non-specialist teachers have reported using it with great success for practice between lessons - this is boosting learning and makes Zim Zam Zoum a real boon to schools that have to buy in languages teaching. The songs are mint! ... I think it's really cool, easy to use and really clever and easy to learn the French that way.. I like the way that the people from France actually sing the songs.. I've never seen anything like it in school.. I thought it was really good how they made the mouths look like they were really saying it.. I think the games and stuff are great to learn the words from the songs.. I think that it's really fun and everything that has been done to make it - I would like to say a really big thank you! ... We always enjoy watching again and again to watch out for things in the background. We spot things each time and it is always fun- simple as that ! My students LOVE the songs and they've learned a good deal of French with them. Upon my return to Anguilla, I immediately played the audio CD for them..bodies started swaying, toes were tapping, fingers snapping. One boy got up out of his chair and danced around the room ! ZZZ is a fun and easy way to learn French at home and school. Zim Zam Zoum is brilliant! It makes people enjoy learning French. The singing is the best bit. ZIM ZAM ZOUM is excellent, very successful. The children love it as it is so interactive...It also allows you to go at your own pace, suited to age group and ability, as you can pick and choose bits that are suitable. Please find below a short description of my findings in using Taught By Song in my classes. I have been using the demo version of Imagine with a class of year 3 children and wanted to comment on the impact it had on all children in the classes, but particularly on one autistic child in Year 3. I played the song once at the end of a lesson, telling them that they would learn colours the following lesson. One half-term week and one snowy week later (which really means three weeks later) I started the lesson with some flashcards of colours asking: c’est quelle couleur? To the amazement of the class teacher, teaching assistants and myself, this young child came up to the front of the class and enumerated all the colours as I was showing him the cards - and really enjoyed it. This child always remains in class with us when learning French, and although he spends a lot of time wandering around, he does like to come to do his bit and say a couple of words in French. However I must admit that this child remembering the colours in French just by listening to Imagine once was rather impressive. The class teacher later commented "It was an amazing moment - one I'll never forget"
You have no idea how popular the ZZZ songs are. the children LOVE it and the music itself is so catchy and tuneful too. They readily absorb the grammar points of gender agreement etc and sing like pros right from the start...! Many thanks for raising the enthusiasm in my classroom! They work like Trojans to get time at the end of each lesson to sing! My only real issue is how to let them down gently in the lessons when we AREN'T going to put ZZZ on. I am going to go and live in France. I love the Zim Zam Zoum songs - they're so much fun - they go round in my head and it's really helping me learn French. ZIM ZAM ZOUM Aimed at Year 3 and above, these MFL resources can be accessed in several formats. The Yellow Pack is the mid-priced option, which comes on a DVD-ROM and centres on seven, colourfully animated songs. These Karaoke-style tracks feature the voices of French children and are accompanied by printable song-words in French and English. The idea is that the songs are more like tuneful conversations, which encourage children to learn along with the DVD's central characters - Lucy and her family - who have recently moved to Perpignan. 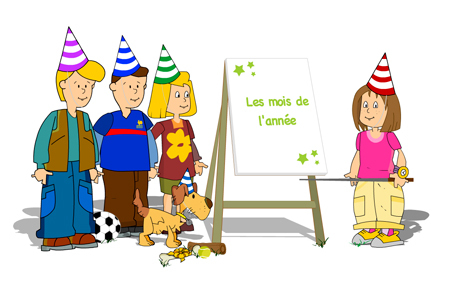 Each of the lively compositions covers a different theme for French beginners, such as asking one another's names, counting to 20, weather, pets and the natural world. Although the emphasis is on conversation and pronunciation, there is an explanation of plurals with Lucy, and dog Nougat, allowing you to practice this new knowledge on the whiteboard. There are also printable activity sheets featuring wordsearches, crosswords, cloze procedures and code-breaking to name a few - the answers are included if French is not one of your strengths. Furthermore, these are available at two levels: Piste Verte and Piste Rouge. The White Pack is for those with Promethean Activboards and, while it's more expensive, it also has more to offer. There are four modules comprising of six or seven units, each of which is again built around an animated song. Because it's designed for the Activboard, 24 interactive flipcharts are included which can be manipulated using Promethean tools such as rub and reveal, roll dice and spotlight. As with the Yellow Pack there are printable activity sheets, plus flashcards, vocab sheets and lesson plans. Don't forget to use Activote to assess progress as you go, too. Each flipchart lesson begins with a spot of revision or a warm-up before introducing new vocabulary then applying this in role-play along with grammar and information about French culture. However, you can chop and change the activities to match your children's needs. A nice touch is the lip-sync to help with those tricky pronunciations, as well as the facility to record, replay and compare your version with a range of native French speakers. Both the Yellow and White options can be complimented by the Blue Pack. This is an audio CD of 13 songs, which includes a booklet containing the words in English and French so you can sing along. As well as the original tunes from the White and Yellow packs, there are also songs about the alphabet, a bus journey, a family allbum, a birthday and a classroom, all of which are recorded in standard and karaoke versions. Songs are often used in language software as rhythm and rhyme help build the pattern of speech and the repetition is less of a chore when set to music. Here the songs use everyday speech, which helps with intonation when having a conversation. The White Pack also lets teachers make their own activities with cross-curricular links to PHSE, music, geography, dance, art, numeracy and literacy - not to mention project work and research. While it doesn't have the gimmicks of some packages on the market, the language teaching is sound and, for those with Promethean boards, it can be taught as is or customised as you see fit. Volume 1, Issue 4 . .....The scene is set by a catchy tune which introduces Lucy, Romain and their friends who live in Perpignan in south-west France. Each unit comes with a green and red route -the green being the standard flip-chart pages which translates to 13 lessons over 125 pages for Unit1 alone, while the red route provided extension exercises. Planning and objectives are very obvious throughout, as are the different learning strands being addressed from knowledge about language, speaking and listening to inter cultural learning. Learning comes in form of songs, interactive activities and games with an interesting tickertape option to view specific vocabulary. Away from the whiteboard there are worksheets, flashcards, vocabulary lists, song words and additional teacher resources, which means that this is a package which lends itself well to meshing with other products and programs. Unit 1 covers colours, nouns, gender, name, age and where you live as well as links to Perpignan. It uses the Promethean tools well - such as the Activote - although a paper and pencil will do just as well in this assessment activity. There is a good balance between listening, speaking and looking at the words, although we'll have to take a look at the complete package to really get the measure of Zim Zam Zoum. “Zim Zam Zoum” has been written by an experienced prep school teacher of French; it is aimed at children aged 6 to 12 and may be used on an interactive whiteboard or on an individual computer. Module 1 is engaging, well executed and reasonably priced (of which, more anon). Module 2 was due in January but I have yet to see it. I am looking forward to using the materials with my Year 4 classes – maybe with other groups too, but probably with the lower end of the age range mentioned. The material consists principally of insidiously catchy songs presented as agreeable animations: I found myself humming the songs myself after just one listening! The publishers’ website, significantly, is called www.taughtbysong.com and the materials target (very successfully, I think) the power of rhythm, rhyme and repetition to enhance the learning process. The topics covered in the first module are: greetings; presenting yourself; colours; numbers 1 to 20; days of the week; nouns of the natural world; weather; animals; animals/describing pets. There is also some grammar (hooray! ): gender; forming the plural of nouns. Also provided: printable song-words, 35 printable differentiated (piste verte, piste rouge) activity sheets. Technically, I found the DVD ROM worked very well: navigation is easy – though the brief jingle which accompanies each return to the Home Page is irritating! The cost? The standard version, usable on any IWB, costs £79.95 + VAT for a school site licence. You can also buy an extended version (£179.95 + VAT for school site licence) designed for use on Promethean IWBs; this version includes 24 extensive Promethean flipcharts of interactive exercises, printable flashcards and vocabulary lists. Also available, audio CDs including the full instrumental versions of the songs plus karaoke tracks; the CDs can be bought in bulk and sold on to pupils if you wish. If you are looking for an engaging and comprehensive scheme to teach primary French, the innovative and stunning Zim Zam Zoum software from Taught By Song could well be the solution. It will be published first in Promethean's Activprimary format (Module 1, the first year's teaching, available Spring 2009). As the name implies, Taught By Song use the medium of song as the basis for their French teaching scheme, building a progressive series of exercises around the topic presented in each song. Their website (www.taughtbysong.com) contains interesting insights into the power of song to enhance language learning. The new three Rs (rhythm, rhyme and repetition) develop patterning skills and improve memory, whilst music has the ability to connect the right and left hemispheres of the brain and improve learning. Not to be underestimated also is that a song repeats itself to learner over and over again,way beyond the walls of the classroom, providing natural and meaningful repetition which aids long-term memory. What is special about this package, is that the songs are not only original, melodic and catchy, but are also accompanied by full flash animation of a charming set of recurring characters. The animation is very high quality, with accurate mouth shape synchronising with the words, as an extra aid to pronunciation. The words are skilfully written in dialogue form to act as a springboard to role-play. Zim Zam Zoum is a remarkably flexible scheme, with a fabulous choice of exercises and games for the interactive whiteboard, which make full use of Promethean's excellent range of tools. The interactivity goes way beyond the normal drag and drop exercises and the activities show clear progression. All five skills of the KS2 Framework for languages are developed. In trials, Zim Zam Zoum has proved to be motivating, engaging and fun, giving pupils a sense of achievement in their learning. It caters not only for different teaching styles! It is well supported for non-specialist teachers, with clear guidance notes to all the activities, as well as 'click-on' recordings of the vocabulary and sentences, spoken by native French voices. At the same time, the scheme has considerable depth, in-built differentiation and plenty for specialist French teachers to get their teeth into! The quality of the songs, animation and interactivity, together with the obvious language progression, make this software stand out. 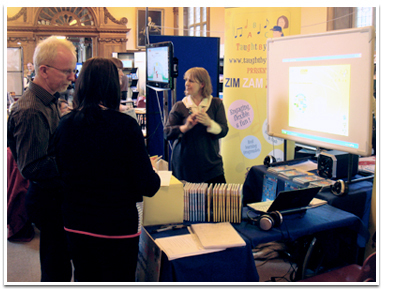 ZIM ZAM ZOUM Module 2 was previewed at the Languages Show at Olympia to a great reception ! The whole Taught By Song creative team was present, including composers and French animators and we were asked to produce our resources in a huge range of languages. It was particularly noticeable how attracted many teachers were by our simple animated grammar explanations, as well as the animated role-play songs. Thank you to all who visited the Taught By Song stand at this excellent conference. We were pleased to have the chance to talk to so many enthusiastic Primary French teachers in Yorkshire. Our talented song-writer, John Hyde, was able to attend this time and was particularly happy to hear how well his catchy melodies were contributing to pupils' enjoyment and motivation in the French classroom. Taught By Song were pleased to attend this splendid Primary MFL conference at Durham on 11th June, where creative teaching through song featured strongly amongst the workshops. We were overwhelmed with interest from visiting delegates, who watched demonstrations of Zim Zam Zoum, not only enjoying the animated French teaching songs, but also trying out the huge variety of flipchart interactive exercises and games. What a time-saver to have these wonderful ready-made exercises using all the Promethean tools ! was one of the many comments in appreciation of the comprehensive Promethean version of the Zim Zam Zoum software. Lucky teacher, Amy Bell, won a free copy of the Promethean version of the software in the prize draw ! 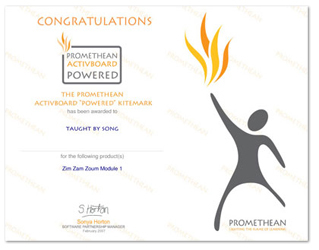 accredited with the top kitemark from Promethean Activprimary. This award complements the wonderful reception the animated songs have received. review by Lord Dearing that all children should learn a language from the age of seven. This should happen by 2010, as part of the next curriculum overhaul. Read full story on the BBC website.